During World War II the British developed and deployed one of the legendary sniper rifles of that generation, the No4 Mk1(T) and No4 Mk1*(T). These rifles were created using production No4 Mk1 SMLE rifles that demonstrated above average accuracy and then sent them off to Holland and Holland (H&H) for modification into the sniper variant which was annotated with the (T) in the designation. More than 12,000 of these rifles were built and deployed during WWII with excellent effectiveness. After World War II ended, most of the militaries around the world drastically reduced their sniper programs and as such very limited development happened in the U.K. for a replacement sniper rifle for the No4 Mk1(T). But once again the U.K., as well as many other nations, found itself in several smaller scale conflicts around the world where snipers were needed and the No4 Mk1(T) continued to perform acceptably where needed. But in the 1960’s the member countries of NATO adopted a standardized cartridge that all NATO rifles would use, this cartridge was known as the 7.62x51mm NATO, and its civilian counterpart is known as the 308 Winchester. With the adoption of this new cartridge and the realization that snipers were indeed still needed and that their existing sniper rifle was in need of updating, the United Kingdom decided to develop and adopt a modernized sniper rifle. In 1970 the No4 Mk1(T) and No4 Mk1*(T) rifles were replaced with an updated version known as the L42A1 which were built from these existing No4 sniper rifles. This conversion was performed by the Royal Small Arms Factory, Enfield, and incorporated a number of changes. Of course, the most apparent change was the conversion from the .303 British cartridge to the new 7.62x51mm NATO cartridge. This involved a significant extractor change as the new 7.62x51mm was a rimless case while the old .303 British had a rimmed case. This also necessitated a change to the ten round detachable box magazine so that it would properly feed the new 7.62x51mm NATO round. Since the barrel needed to be replaced to accommodate the new cartridge, the decision was made to upgrade the barrels as well to help improve accuracy. A lot of new information had become available since the end of WWII in regards to ways of improving accuracy and one of the discovered methods was to have a free floated barrel where nothing touched the barrel allowing it to have consistent and repeatable harmonics to aid in accuracy. In order to do this, the standard No4 Mk1(T) stock was sporterized by cutting the forearm down to just in front of the front band. The rest of the wood stock was pretty much left as it was on the original No4 Mk1(T) rifles, including the raised wood cheekpiece that was attached to the buttstock. The chosen barrel was a 27.5″ long hammer forged barrel with 4 lands and grooves utilizing a right hand twist of 1:12″. The old No4 Mk1(T) rifles had a left hand twist with 5 lands and grooves. The hammer forging process of barrel construction actually left a snakeskin like appearance to the finish of the barrel that is visible to the eye. The external sights were once again retained for use as back up sights in the case of an emergency failure of the optics. Scope mounting remains the same as on the No4 Mk1(T) with a screw on scope mounting bracket on the left hand side of the rifle. The scope was a new version adapted from the No. 32 Mk3 from the No4 Mk1 (T) and it is a fixed 4x scope known as the L1A1. The BDC on the elevation drum was remarked to match the ballistics of the 7.62x51mm NATO instead of the .303 British. The L42A1 served with the United Kingdom military until 1985 when it was decommissioned and replaced by the L96A1. The L42A1 is reported to have been used with great success by the SAS, Marines and Paratroopers in Aden, Northern Ireland and the Falklands. It is also rumored that the SAS pulled them out of retirement during the 1991 Gulf War and mounted S&B 6x PM scopes on them to be used alongside their L96A1’s with great success. The rifle pictured on this page, serial number AR 10097, is owned by Stephen H. and we are grateful to him for his additional information about the L42A1 that he provided for this page. 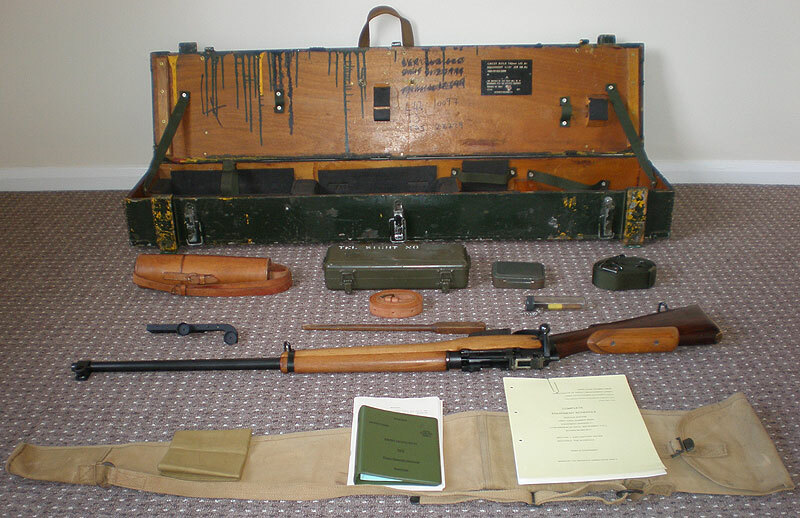 The rifle is in the same original condition as it was when decommissioned from the British Army in about 1988. It was one of the eight rifles that served with Stephen’s old unit, the 3rd Battalion of The Royal Green Jackets. The L42A1 balances well in the hand with the shortened forearm being well proportioned. The firing position of both the No4 Mk1 (T) and the L42A1 is very low adding to its effectiveness when used in the field. As is common with all sniper rifles from that era, there is no provision for a bipod so the rifle needs to be fired from a rest, such as a sand bag, or from the unsupported position, of which it is well suited. Bolt operation is smooth and the ejection of the case is very positive and the brass is ejected down and very close to the rifle to aid with policing brass when leaving a Final Firing Position. Stephen’s rifle is now fired only with handloads using the Sierra 168gr Match King bullet and Reloader 15 powder. Looking at the picture of the “Huns Head” target you will see that the rifle still shows excellent accuracy. 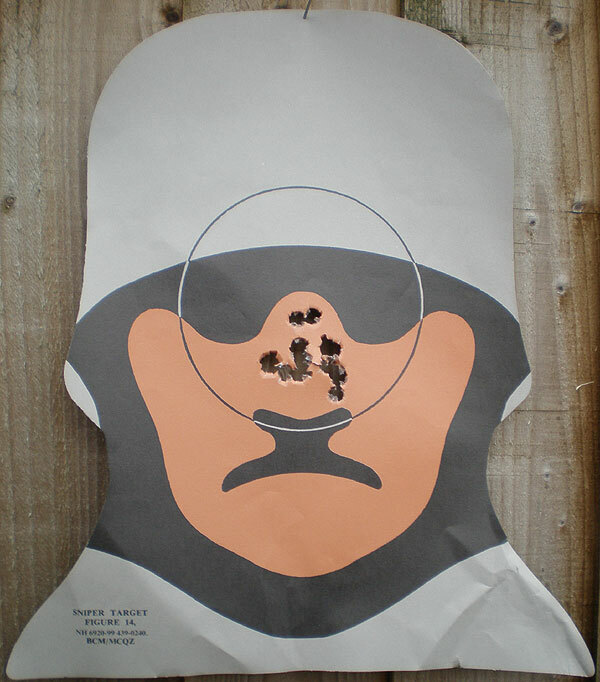 That is a 15 round group fired at 200 meters (219 yards) and measuring 1.5″ center to center. For those of you that are keeping track, that is a .65 MOA group of 15 rounds fired at 200 meters with a 4x scope. Yes, these rifles were quiet accurate, in fact, it is the scope that holds the rifle back in this case. 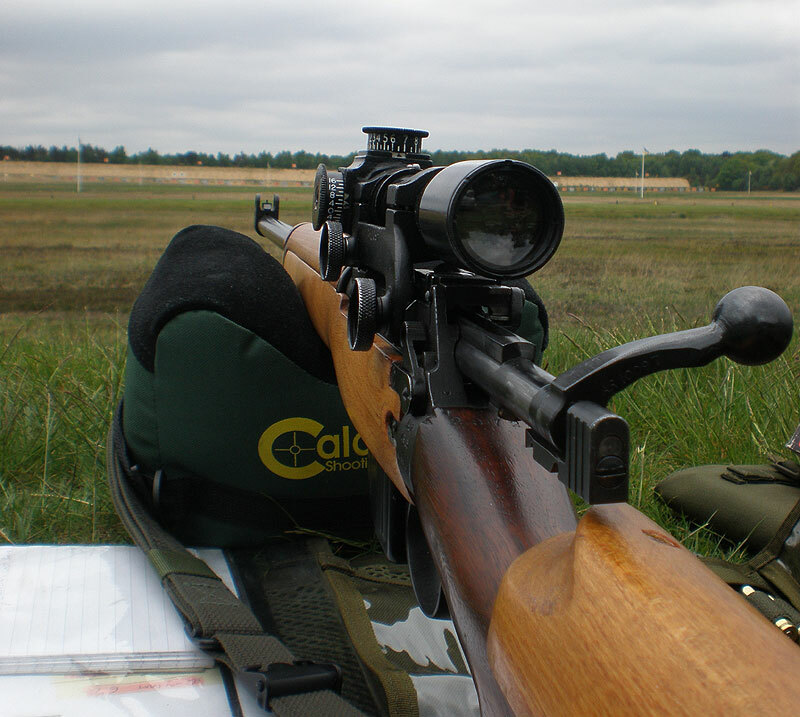 Reportedly, those SAS troops that mounted the 6x S&B scopes on the L42A1’s were able to consistently hit man size targets at 1000 meters with that setup. Not bad indeed! The L42A1 is a descendent of a legendary sniper rifle from WWII and it proudly carried that tradition onto the battlefield well into the later part of the 20th century, until it eventually needed to be replaced by a more modernized sniper rifle. There was also a law enforcement version of the L42A1 known as the “Enforcer” which had a Pecar 4-10x variable power scope mounted and with a lighter trigger. The L42A1 does not appear to have been used outside of the UK but it holds a place as one of the classic sniper rifles from the 20th century. 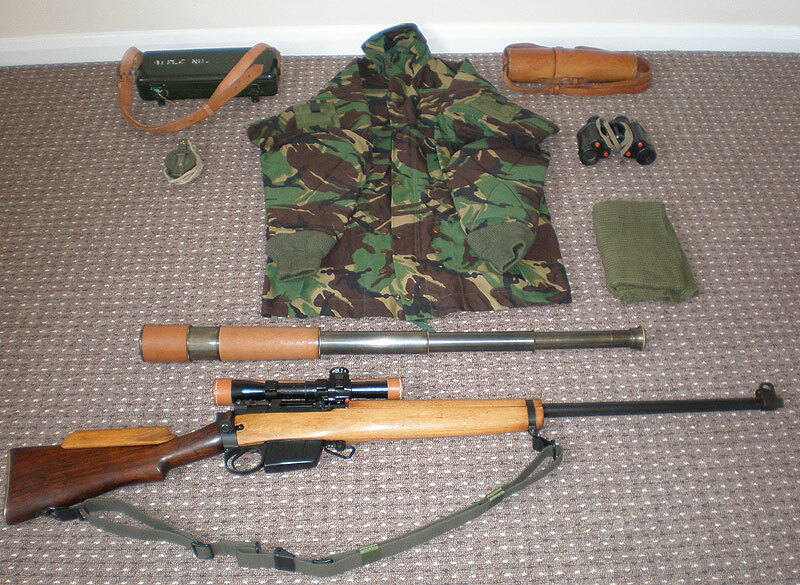 I was a badged Sniper in 1 Para , ‘C’ Coy….The L 42 was my weapon of choice……Fantastic……Qual I had one now….. I actually own an Enforcer, and the snake skin effect on the barrel is extremely distinctive and the times I take it to Bisley, yep it sill shoots at a 1000 yards quite accurately, leaves guys drooling over the rifle, especially when they see the barrel. .65 MOA from a weak, flexible Lee-Enfield rear-lug action and a hammer-forged barrel firing a .308-caliber bullet. For some reason I’m inclined to not believe it. And how do you consider that being “held back” as if its disappointing? What’s most interesting is the “roundness” of the group. Its a little too “ideal”, but its probably exactly what someone creating a story about a sub-par rifle would fake if he weren’t smart enough to realize that groups at that range tend to have some stringing rather than a tight cluster. And excellent 1000-yard accuracy with the low-power scopes used on those rifles? Give me a break. Yep, it can, and does happen. Fired slow fire in ideal low wind conditions from a rest with excellent handloads, that accuracy is possible with these rifles. The Original No4Mk1(T) rifles were built from No4Mk1’s that showed exceptional accuracy when test fired, they were then modified by H&H to (T) sniper specs. The L42A1’s were No4Mk1(T)s that were then further modified by converting to 7.62×51 NATO and further improved with a better barrel and other changes. The 4x optics makes it more difficult to shoot consistent and accurate groups, but yeah, higher mag may not help with the group above as it is already excellent and “may” be the best it could do, but we don’t know. 1000 yard hits on man sized targets with a 6x scope is perfectly feasible. We do it, why wouldn’t special operations snipers be able to? Realizing that it’s a 200M group, that the shooter was obviously well supported, and understanding what it actually takes to shoot like that….with awesome awesome hand loads…I absolutely believe it. 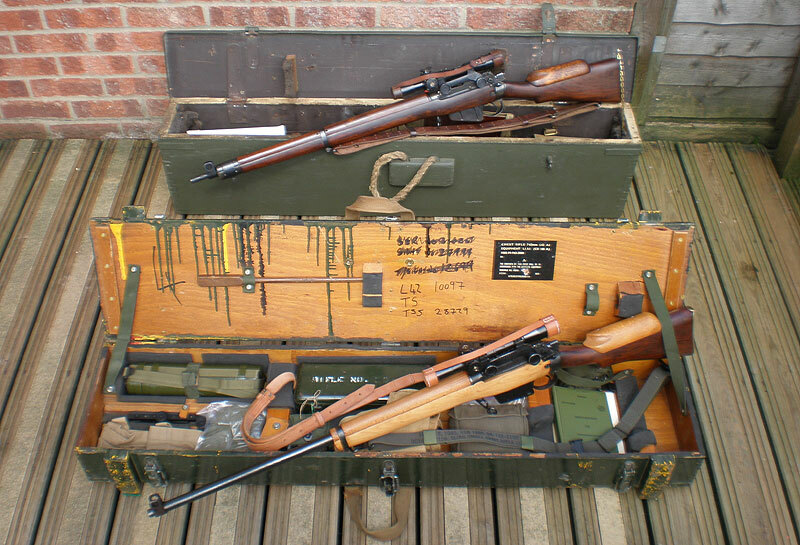 We have to realize that Holland and Holland did the original conversion to the sniper version No4 Mk1 T…..the receivers and base rifle had to be virtually perfect. Go look at what a rifle from Holland cost! Thank you for sharing and writing this article. Gun Lord, I’m the owner of the rifle in question and I shot the group. Be assured the Huns Head group is totally legit. As already stated the ammunition was hand loaded and was singularly loaded into the rifle by a colleague so cheek weld and fire position wasn’t disturbed through cycling the bolt, further more the L42 is a mag fed weapon so to aid smooth chambering the extractor was exchanged for a standard no4 extractor. Isn’t the standard one made for a rimmed cartridge? How would that work with a 308? The L42 has its own extractor which engages with the base of the case as it is pushed from the magazine, this is why it is a mag fed weapon and is in all likelihood a military feature to keep the round “captured” whilst being cycled. The no4 extractor has I think a shorter tooth which can not engage with the case until chambered where it drops into the gap between the case’s base and body which provides enough contact to extract. The no4 action has been converted to .308 since the 60s and was the standard way to extract by civilian shooters. hello, well I have found in france one of these with the .303 barrel, M47, 1946, 5 groves wood as the L42 including cheekpiece. It seems that it is one of the trial batch, there is a picture in a sniper book “out of nowhere” page 282. Gun Lord, nice group. McQueen should be interesting to shoot. This stuff about the deficiency of the Enfield’s rear locking is as spurious as the so called head space and magazine rim lock problems.